THE ONE SHOWING IS THE EXACT ONE YOU WILL RECEIVE. CLASS AB CAR STEREO AMPLIFIER. ORGINAL BOX WITH MANUAL. 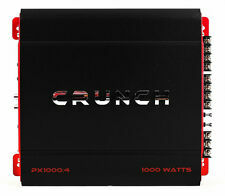 The engineers at Crunch aim to make every system the best it can be. The Class A/B mono amplifiers are 1-Ohm stable and the 2 and 4 channel amplifiers are 2-Ohm stable. PZX Series Monoblock Class AB Car Amplifier. Vintage The Crunch CA2125 Mosfet Powered Amplifier TESTED WORKS PERFECT sub amp. Condition is Used.2 channel bridgeable amp.perfect for sub amp.has built in crossover.200x2 or 400x1.perfect working condition. works like new.fully functional cool rare vintage piece . JL Audio XD400/4v2 4-channel car amplifier — 75 watts RMS x 4. Condition is Used. In great working order and comes as shown. It’s missing the cover as shown. 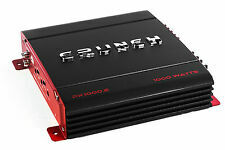 Kicker CX300.1 Mono-Channel Subwoofer Amplifier 300W RMS Car Audio Upgrade. Condition is Used. Shipped with USPS Priority Mail. Slim Design Get pure bass with the Boss Audio Elite BA1200 Class A/B Monoblock Amplifier. With 1200 Watts Max Power and MOSFET power supply, you'll feel every beat. 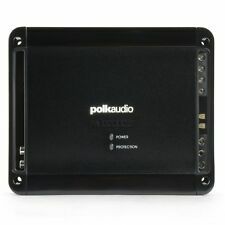 Customize the sound with Variable Low Pass Crossover, Bass Boost and Remote Subwoofer Control. The Elite series of amplifiers packs incredible power and performance into a feature-rich slim design for put-it-anywhere convenience. MTX Audio TC2002 Peak Power 200W RMS, Thunder TC 2-Channel Amplifier. RMS Power @ 4 ohms 50 watts x 2 channels. RMS Power @ 2 ohms 100 watts x 2 channels. 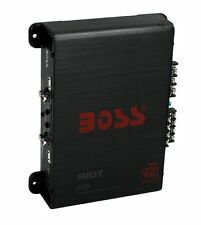 Bridged RMS Power 200 watts x 1 channels. RMS Power @ 1 ohm Not Stable. Parasound Halo A23 Power Amplifier, Silver, Excellent Condition - No scratches or operational issues. Original owner - bought new in 2018. Ships in original box/packing with powercord, 12v trigger cable, and manual via UPS Ground. 3500 watt amplifier one channel With Inverter. Condition is Used. Shipped with USPS First Class Package.